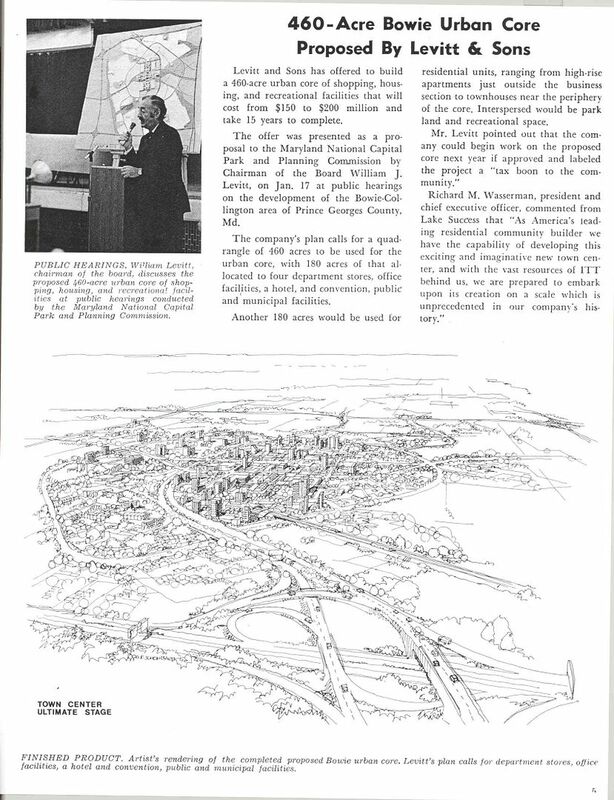 was Bill Levitt's New Town concept for Bowie, Md. Originally planned as a mixed-use complete city, Levitt announced in 1970 that the New Town would have an "urban core" surrounding a lake. Residential neighborhoods would emanate outward from this core. Housing types would be significantly varied, and would include virtually all types of dwelling units, including rental units. With such a varied housing stock, a wider range of income levels of residents could be accommodated. It was somewhat of a bold new concept, right in line with New Towns of the time, such as Columbia, Md. and Reston, Va.
B O W I E , M D .
Location: City of Bowie in Prince Georges County, Md. Lake Village Information Center on Exhibit Lane off Collington Road, just south of Route U.S. 50. Sample Homes Exhibit for the various neighborhoods of Lake Village were also at this location. The Exhibit Center remained at this location until the models for Northview subdivision models opened around 1975. Street naming: Alliterative by section name (N in Northview, P in Pointer Ridge). Official web site for the City of Bowie. Lake Village is composed of several smaller projects. Similar to Levittown, N.J., at first the initial focus was on advertising the overall community of Lake Village, of which Arcadia was the first section. When the community plan was refocused, the advertising emphasized the individual neighborhoods, including Northview and Northview Estates. 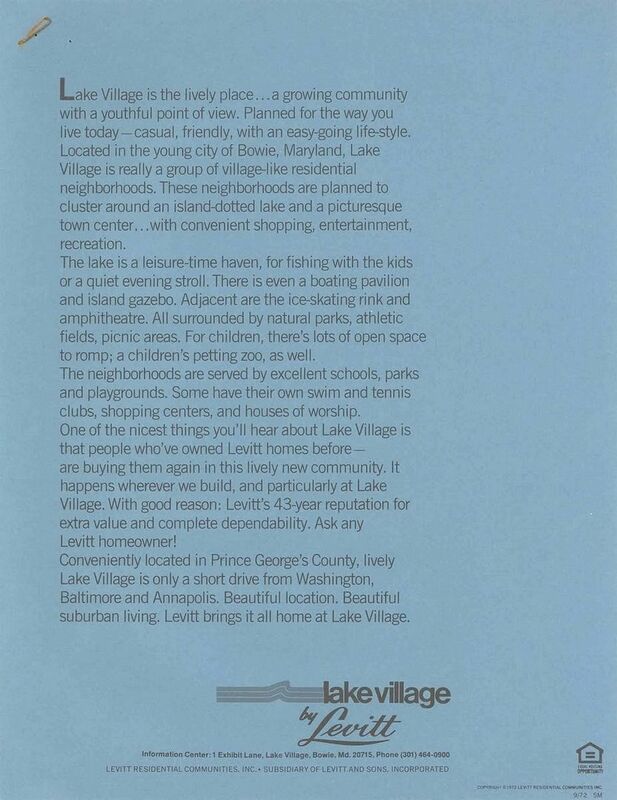 All of Lake Village as planned by Levitt is either in the Pointer Ridge or Northview sections. Thus, Arcadia today does not really exist as a named entity. Rather, the Arcadia houseline can be identified either as the final phase of Pointer Ridge and the first phase of Northview, with the initial letters of street names being P or N, respectively. Each section of Lake Village can be identified by its unique houseline. The Arcadia houseline is composed of four contemporary models, while the Northview houseline has two traditional models. Northview Estates, which was first section in Bowie to be built by the newly formed Levitt Homes, has yet another line of traditional style homes. There is one additional houseline in Lake Village within the Pointer Ridge section. Offered was a mixture of some of the same models from Pickering Circle, Ltd in Upper Marlboro, Md., Crofton Estates in Crofton, Md., and a prototype home from Greenbriar in Fairfax, Va. We have not come across any advertising for this section, so its name is unknown at this time. View the Community Profile for Lake Village in the new town of Bowie. Read about Lake Village's neighborhood plan, schools, recreational, entertainment, and shopping facilities. And at the center is a picturesque lake with walking paths, a boathouse, fishing, and a secluded island gazebo. View the Location Map for Lake Village and the Prince Georges County area. The communities of Crofton and Northampton--locations of other Levitt communities--are also shown. 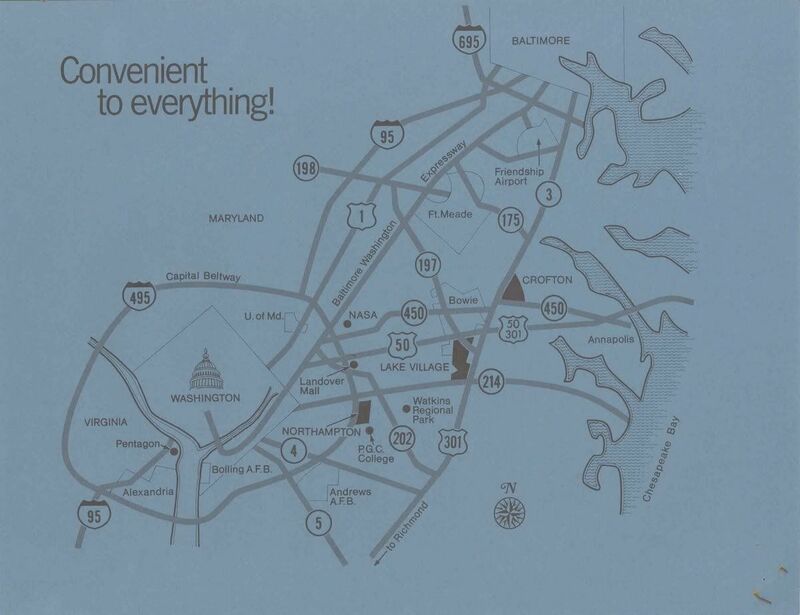 Lake Village is convenient to major highways, as well as Washington, Annapolis, and Baltimore. The initial homes developed for the opening of Lake Village were California contemporary in style. At the same time, Levitt's traditional line of models from Belair Village was still available. Sample homes for both houselines were available for inspection at the new Lake Village Exhibit Center, which was located at the former Belair Village Exhibit Center. 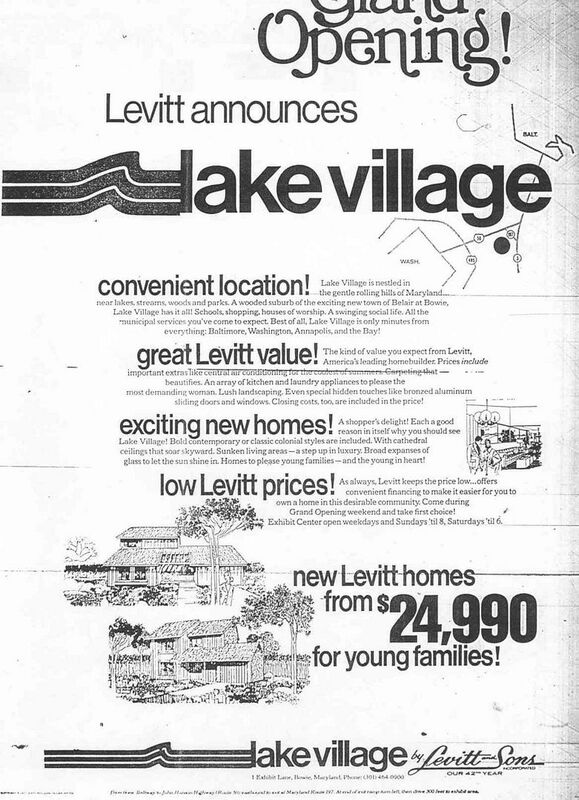 View original newspaper sales advertisements for Lake Village. Page last revised 22 September 2007.